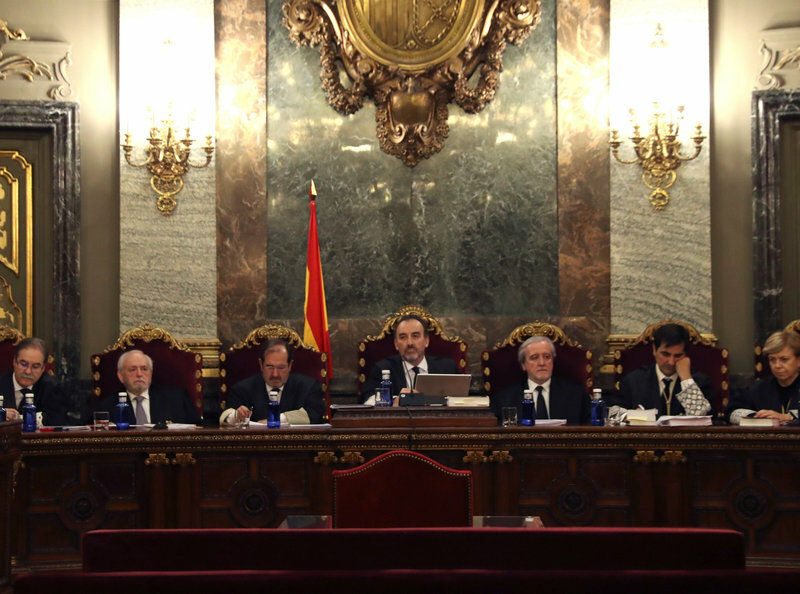 The Supreme Court judges who will try the Catalan independence leaders in Madrid ACN. The millions of Catalans who have been shaken by having seven of their high-level politicians and two civil society leaders in preventative custody for over a year, for their non-violent defence the right to self-determination, will be shaken again, tomorrow, as the trial against them, and three other prominent pro-independence figures, begins. “Democracy is on trial,” argue the defendants, who have maintained that self-determination is a right, not a crime, since autumn 2017, despite the lengthy prison sentences hanging above them. The trial will be broadcast live on television (El Punt Avui TV), as well as being livestreamed online by the Supreme Court. The ’TV effect ’may cause a few relaxations to the typical processes in president Manuel Marchena’s court, though it remains to be seen if they will be allowed to sit next to their lawyers, to better guarantee their right to defence council, and to ensure they are able to communicate constantly. The nine lawyers will surely also take advantage of the TV effect, as will those making the accusations, especially the far-right party VOX, who by a quirk in the Spanish legal system, were able to add themselves to the prosecution case. The trial is scheduled to begin tomorrow, February 12th at 10am. The court has not published a schedule of the planned sessions. Sources say this might emerge after the defendants have finished their initial statements. Thereafter, there are over 500 witnesses to be called, and most will have to travel from Catalonia. As such, despite the desire to do so, it seems unlikely the trial will conclude before the May municipal and European elections.